The farmhouse Baglio San Pietro is located in the centre of Sicily, about 800 m above sea level, surrounded by forests and meadows, on the outskirts of Nicosia and not far away of Sperling. We recommend to reach Nicosia by car, but there are also daily buses to the principal cities. 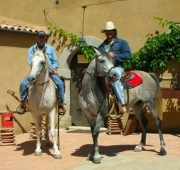 The farmhouse Baglio San Pietro is the result of the restoration of an antique farmhouse. It consists of two courtyards and a garden in which there is now a swimming pool. The accommodation consists of 9 rooms, a restaurant for up to 100 people, a meeting room for 50 people, a small library and some communal areas both in the interior. The property is the heart of a structure is the heart of a farm, where are traditionally kept sheeps, cows, horses and donkeys. 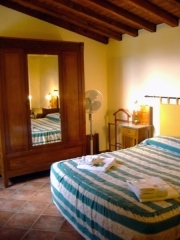 Baglio San Pietro offers to its guests Bed and breakfast, half board or full board. Private and free access to swimming pool, mountain bike rental, guided tours of the property, information material about the area. Upon request, laundry service, baby sitter and cooking lessons of the sicilian cuisine. A19 Palermo-Catania, exit Ponte 5 Archi (97km) and then follow the signs for Nicosia "Centro", just before entering the town, turn into Via Panotto. A19 Palermo-Catania, exit Mulinello by Leonforte and then follow the signs for Nicosia "Centro", just before entering the town, turn into Via Panotto. A20 Messina-Palermo, exit at San Stefano, drive past Mistretta and Nicosia.